If you need a straight-through coupler, please see 180 0410. Connect voice/data cables together with this inline coupler. 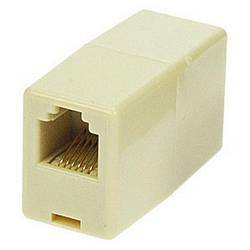 The 6P6C connector is generally used to tie standard home telecom lines. Not certified to any standard, so may not be suitable for high-speed networks. Note that "reverse" wiring is standard for home telephone systems.